Reviewed on 23rd August 2017. Being a teacher as well as a theatre fan this play seemed perfect. It had the right elements and touched on the correct subjects for it to really appeal and resonate with teachers but I’m not entirely sure what it was trying to be? A comedy or serious piece? There were some funny one liners and the cast (Hilary Murnane, Craig Webb and Faye Derham) did a good job of showing the daily lives of young teachers but I was unsure what the play was really trying to show. Faye Derham was really effective as Ria the PE teacher who pretends not to like her job whilst secretly caring quite a bit. She was very convincing and I could relate to her character most of all. The storyline about her student with bulimia was very interesting and could have been explored more but this again leads to the question was the play a comedy about three teachers who want to ‘f*ck the diet’ or a serious piece about teachers lives and the different roles teachers have to become from social services to counsellors, confidant to educator. The space was full (mostly of fellow teachers I’m guessing) and the audience enjoyed the one liners. The play ended on a long applause at the end. I think it could be really successful if it understood its target audience and focused on one aspect more. Overall I enjoyed my first Fringe play and was impressed with the staging, music, lighting and acting considering the size of the space and quick turn around after the previous act. If you are a teacher then there are parts of this play that will definitely resonate with you and I think most teachers will be able to relate to some of the issues facing the three young teachers. 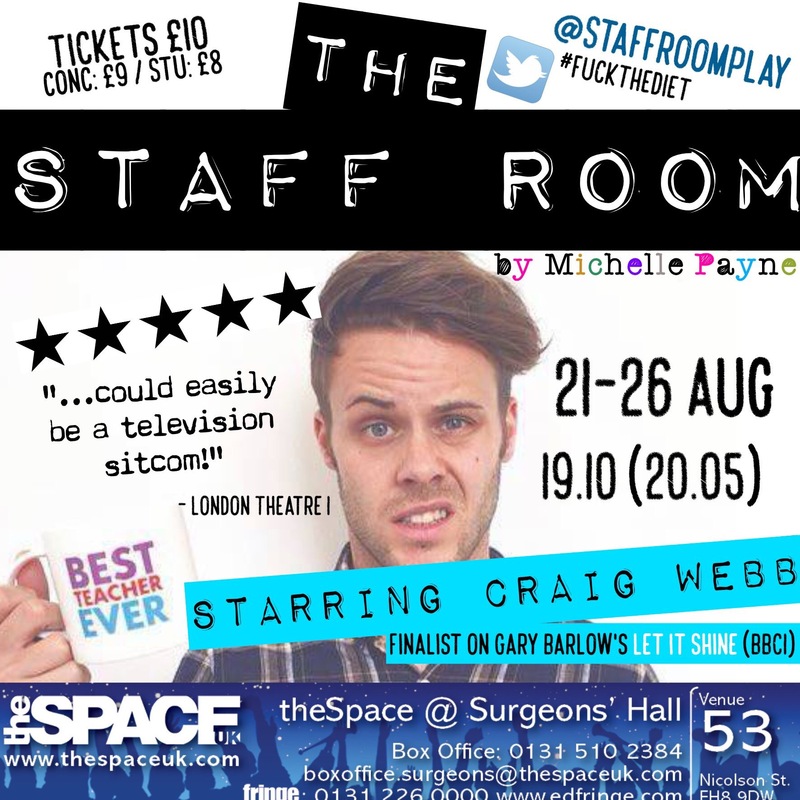 The Staff Room is playing at theSPACE@ Surgeon’s Hall in Edinburgh until 26th August.